Anti-Static Cellophane Tape comes with a pre-printed message. This static-free cellophane tape has a natural rubber adhesive and is perfect for use with static sensitive products. 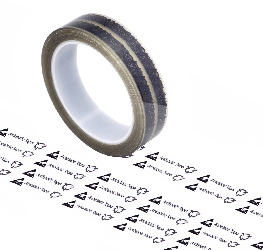 The 1/2" x 216' anti-static clear cellophane tape comes with a pre-printed message. This static-free cellophane tape has a natural rubber adhesive and is perfect for use with static sensitive products. The pre-printed message is "Antistatic Tape". The 1" x 216' anti-static clear cellophane tape comes with a pre-printed message. This static-free cellophane tape has a natural rubber adhesive and is perfect for use with static sensitive products. The pre-printed message is "Antistatic Tape".